You’re ready to start a marketing campaign; a newsletter, social or some paid campaign. Your main goal is to drive traffic back to your website, convert that traffic into leads, and those leads into customers. So, how do you tell which marketing campaigns were successful? Easy. 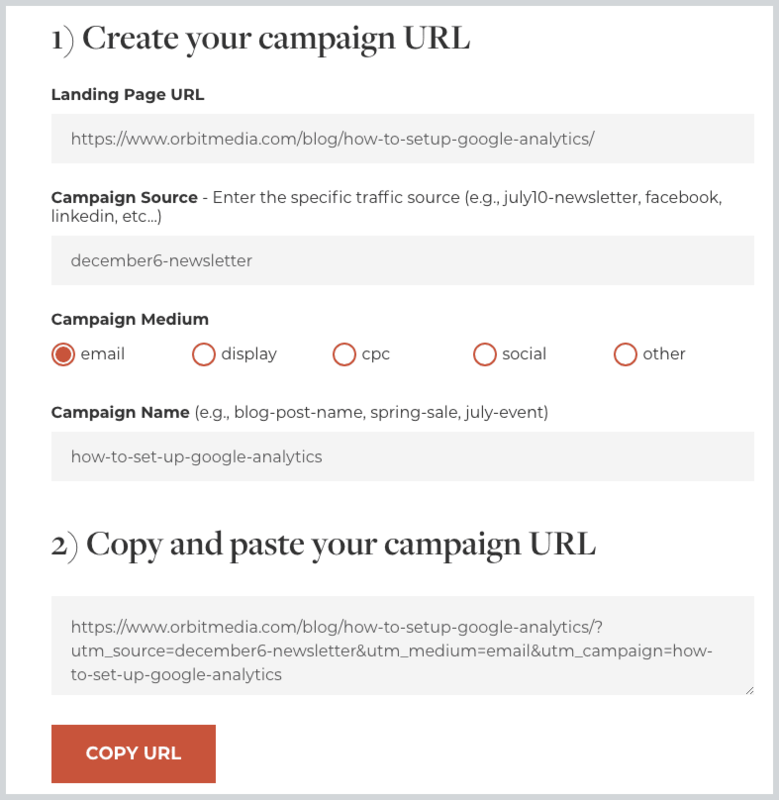 Use the Google Analytics URL builder to track your campaigns. There are many ways to use campaign tracking. We’ll focus on email marketing and then you can apply that to all of your other marketing efforts (ads, social, affiliate links, etc…). See all of those extra goodies in your link? That is the campaign tracking code. Why use the Google URL builder? Most of your marketing, whether it’s an email, an ad, social promotion or any other marketing effort, has the same goal: conversions or awareness. The URL builder allows you to track each marketing effort separately in Google Analytics. If you don’t track your marketing campaigns they get lumped in with all of your other traffic. So how do you know what’s working and what’s not? This is especially important for paid marketing. If you’re spending money, you should definitely know what’s getting you the best results. 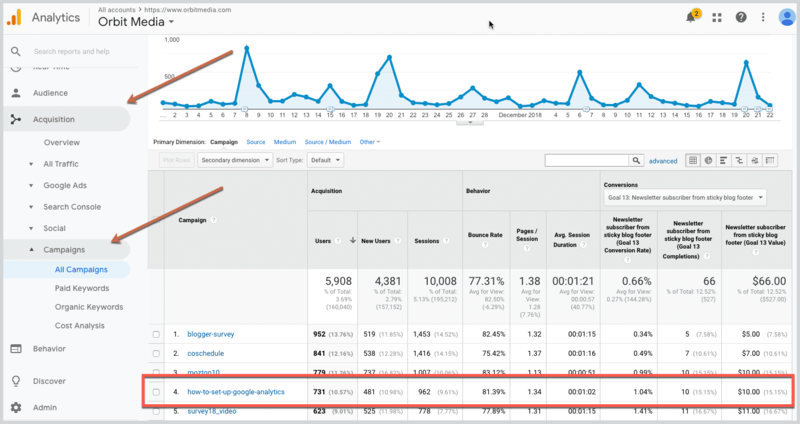 Before you get started, you should have goals set up in Google Analytics. Here are detailed instructions. Your email service provider or social platforms will show you click through rates, impressions and views but they don’t tell the entire story. In Google Analytics you can see exactly which campaign drove the most sales, subscribers and leads. Repeat these steps for all of the links that you want to track in your marketing. To find actual conversions, look towards the top right of the table, below the line graph. You’ll see a column for conversions. From the dropdown, you can select which goal conversion you’d like to see. In our example, we are looking at newsletter subscribers. Now you’re able to see visits and goal conversions for each campaign. If you go back and look at trends over time, you can see what types of articles people spend more time on and which ones are more successful. 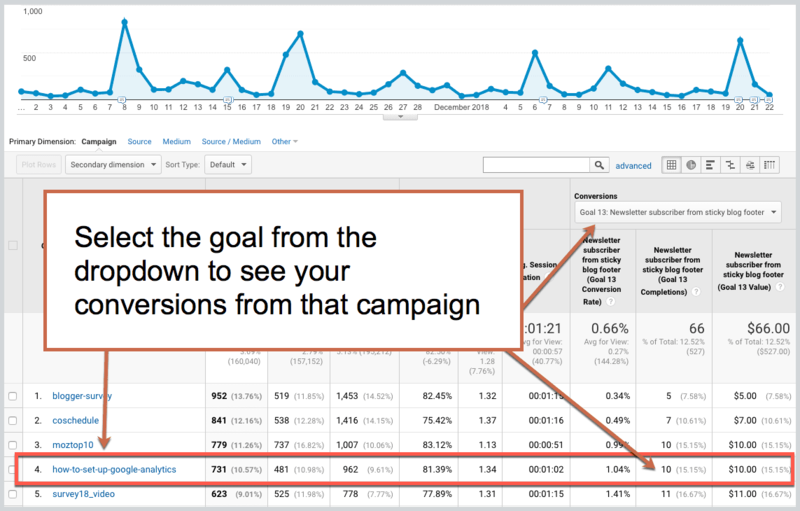 If you want to get really geeky (and we hope you do), you can use Google Analytics and Google Sheets to see all of your top converting pages in one report. That’s it. Now you’ll be able to see who is actually converting from your marketing efforts. If you have any additional tips, please leave them in the comments below! Well done! It’s unfair that you had the team build a tool for you and this post. Why don’t they ever build tools to go with my posts?! Did you remember to bribe them with Lattes? 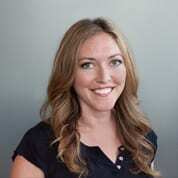 Hi Amanda, for me to capture the utm parameters on GA, do I need to setup any custom dimensions or will they get auto captured into the Source / Medium & Campaign fields? We weren’t sure so we have currently setup custom dimensions with ‘hit’ level scope. 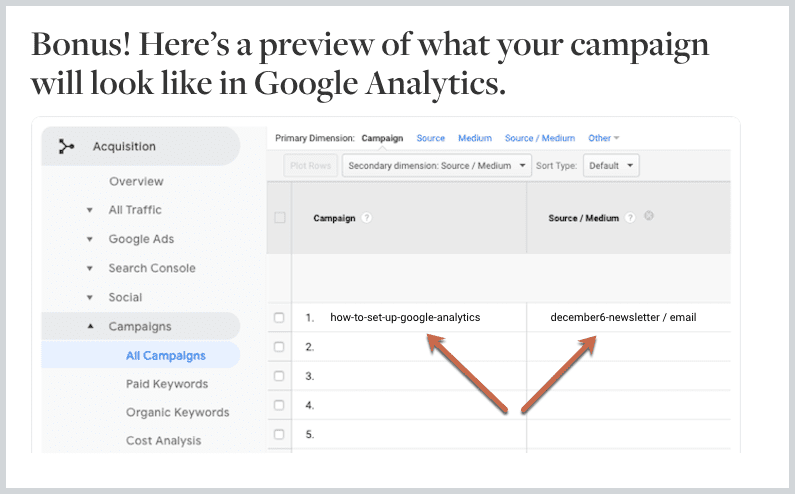 They will automatically be in your campaign reports in Google Analytics as long as they are tagged properly. All you need to do is go to Acquisition > Campaigns > All Campaigns. Let me know if you need more help! For some reason, this is not populating in my Campaigns. However, it is showing up under Real Time > Traffic Sources. I added a campaign name to the URL too. Thank you for the article and all the help! Amazing post, thank you! Very comprehensive, easy to follow, and with clear details. Excellent. I asked a project partner that we’re working with for a few campaign links for something that we are promoting. I have one for our Twitter efforts, newsletter efforts and direct links from our website. For extra clarity, can you confirm that these will NOT show up in Acquisition > Overview under Social, Direct and Referral, but will indeed show up under Acquisition > Campaigns? I need to be able to measure the hits our partner gets from our promotional efforts. Great article. Manual URL builders are quite time consuming, especially today when everything is about links and link tracking. Automated link management tools and URL builders can save much more time and ensure tagging consistencies, reduced errors and a more enjoyable tagging experience altogether.